I read this to my 4-year old before bed tonight. She likes ghosts and such, so I knew it would be ok. The illustrations (by Bonnie Lieck) are very beautiful and kid friendly. 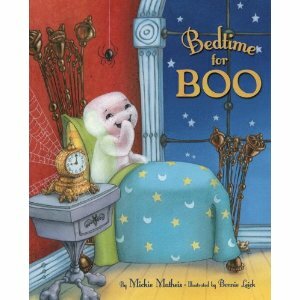 The story (by Mickie Mathis) is about Boo and his family, who live in a haunted house. Boo is very excited because he gets to go haunting like the big ghosts. As you can imagine, he is still wound up when they come home at the end of their night of haunting. Mama Ghost has to get Boo to go to sleep. She does that by getting him to close his eyes and listen to the world around him – the house, the animals, the weather outside. Soon, he has fallen sound asleep. My child liked the story. She liked looking at the illustrations and pointing things out (like monsters). It was a nice “quiet” book for us to read before she went to bed, so I appreciate that as well. This book would be a great Halloween gift for a young child (to be read to), or a young reader (maybe 1st or 2nd grade). I received this book from the publisher through Edelweiss in exchange for an honest review. All opinions are my own. 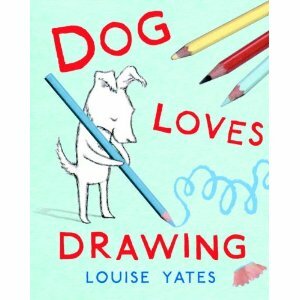 Louise Yates (author of Dog Loves Books) has written and illustrated a fast-moving story about a dog who receives a sketchbook from his Aunt Dora. Dog loves books, but he is initially baffled by a book without pictures and words. Then he figures it out. Bit by bit, Dog brings characters to life, and sets everyone on an adventure that is stopped by a vicious monster. Luckily, Dog has an escape route for himself, and a way to make his friends safe. My daughter really liked this story. She thought it was funny that Dog liked to draw, and especially liked the different characters that came up in the story. My daughters are always coloring and such, so for her it was not a stretch to imagine that the characters being drawn were actually coming to life. The story and drawings are perfect for my 4-year old. The illustrations weren’t overly detailed, but it brought home the point that Dog was drawing the pictures. I thought the story was paced just right. My daughter was caught up in the action and was sad when the story ended. 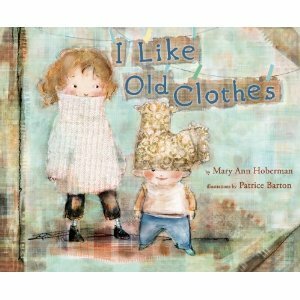 This would be a great book for a young child (to be read to) or for an older child to read on their own. This was originally published in 1976, but is being reissued this summer with new illustrations by Patrice Barton. I don’t remember the original, but this version is certainly delightful. The poem, by Mary Ann Hoberman, is especially appropriate at this time in my house. The girls have been wearing a lot of hand-me-downs, recycled clothes, and DIY clothes. Much like the kids in the book, they think it’s kind of fun to take something and make it their own (or have mom make it into something new – see my experiment here). I don’t think the girls think much about the life an item of clothing has lived before it comes to them, but the kids in the story sure do. They don’t want clothes that don’t have a story – they want to try and figure out how the clothes lived before they came to live with them. It’s a great story and made me think (as a mom) about how thankful I am for friends who pass along clothes, and how I can take something and make it new to my girls. I received this book from the publisher via Edelweiss in exchange for an honest review. All opinions are my own. 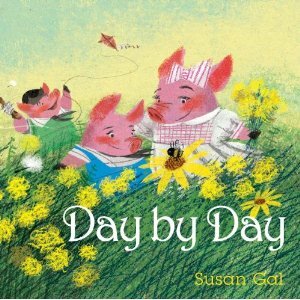 Susan Gal’s book Day by Day, is written for ages 5-9. My 4-year-old really liked it – especially the drawings. She liked how there was a “pattern” to the words (what everyone else would call parallelism, I guess). She liked how the drawings spread across the page and were so detailed. For her, it was nice to be able to pick out the various parts of the actions. It’s the story of a community of pigs and how they live – they plant a garden, they care for the garden, they do ordinary chores, they build a house (of bricks, mind you, so the big bad wolf can’t come in – again, according to my 4-year-old). I think my first grader would be able to read this to her sister, so it’s a pretty easy and quick read. I received this book from the publisher through Edelweiss in exchange for an honest review. I read “The Guardian Duke” a few months ago and LOVED it. I really wanted to read the sequel. Thankfully, the sequel did not disappoint. “The Guardian Duke” left off with Alex and John sailing off to Iceland while Gabriel watched, unable to do anything. However, since he is the Duke of St. Easton and has resources available to him that others may not, he is able to figure out what needs to be done. He decides that it doesn’t matter what the Prince Regent wants, he is going after Alexandra, and will put his resources at her disposal to find her parents. Throughout this book, Gabriel’s wants are subverted at various times and by various factions. He is constrained by family, duty, rivals, and his deafness. One of the most beautiful things in this book is how Gabriel comes to deal with his deafness. The lights that he saw in the first book continue in the second, and play a huge role in allowing him to become “accepting” of his disability. He also comes to realize that the only thing he needs to rely on is God, and that also helps him accept his shortcomings. Often in Regency fiction, dukes are shown as infallible and proud. Gabriel certainly starts out in that fashion, but this book really makes him more human. His story is very interesting, especially given the fact that he is trying to act as though he can still hear, and this is before sign language. Another interesting plot in this book is the story of John and Alexandra. She is still captivating and caring, but she begins to realize how some relationships feel right and others don’t…even if they started out feeling right. I did not like John’s character, there just seems to be something “off” about him. The interaction between Alexandra and John feels wrong. The relationship is resolved during the course of the book, but I don’t want to give away the ending. Something to look forward to in book 3 – there is news of Alexandra’s parents in this book and I can’t wait to see how the journey turns out. I was provided with a copy of this book from the publisher via NetGalley in exchange for an honest review. All opinions are my own. 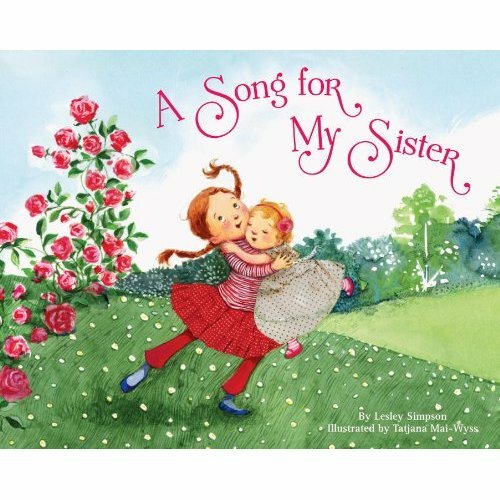 Lesley Simpson’s story about a young girl named Mira who wishes for a sister is a great story about how what you wish for may not be exactly what you want at first. Mira’s wish takes four years to come true. However, when her sister arrives, all she does is scream….and scream….and scream. The baby only stops screaming at her naming ceremony eight days after her birth (the family is Jewish), when Mira sings her a song. This turns into Mira’s second wish, that she and her sister always sing duets – special sister songs that they will make up. My 4-year old liked this book because she thought it was funny that the baby wouldn’t stop screaming. She is the baby of our house, so other than the slightly younger kids at daycare, she’s never really around an infant. She really liked that Mira was the one to get the baby to stop screaming – in fact, I heard her singing Mira’s song as she was getting ready for bed. She likes it when I sing her to sleep, so I figured that would make an impact. The illustrations by Tatjana Mai-Wyss are very nice. There’s plenty of expression in the characters and and you can see the Mira’s frustration with her sister’s screaming. In fact, in one picture, Mira is supposedly sleeping in her treehouse with underwear in her ears and my daughter wanted to see the underwear! Of course, she couldn’t see them clearly, but we pretended they were there. This is probably a book best read to children, as it has a few words that may be difficult for a young reader to pronounce. I will admit, I’m a sucker for Shakespeare-themed titles. 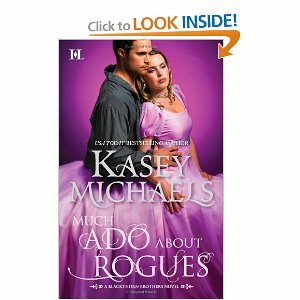 I’ve read Kasey Michaels’ books before and really enjoyed them, so combining that with a Shakespeare-themed title, and yep, I’m going to read it. This is a story about finding your identity. Jack Blackthorn, the middle Blackthorn brother, and the last one to be written about, has been the black sheep of his family for the last 10 years or so. After leaving home at age 18, he struggled to find his place in the world. He was taken in by the Marquise Fonteneau, who teaches him some very useful spycraft. During his time with the Marquise, Jack falls in love with his daughter, Tess. However, things do not end well when Tess blames Jack for the death of her twin brother. Jack leaves and enters the clandestine service of the Crown. When the Marquise disappears, Jack is sent to find him. Jack and Tess have to learn to work together on several fronts…..they have to figure out what happened to the Marquise, what happened that night Tess’ brother died, and who is really calling the shots. On top of that, Tess has to examine her relationship with her father and come to terms with it. Jack also has to examine his relationship with his parents and his brothers and see if he can set aside years of hurt feelings to become reunited with them. I haven’t read the other 2 books in the trilogy, but I will probably look them up. I enjoyed this book – there were so many twists and turns in the search for the Marquise that it was sometimes to determine who was on whose side. I’ve read other reviews that said they missed the “getting to know you” part of the relationship, but I didn’t. It was nice to see how people reconnect after a number of years apart, especially when they didn’t part on good terms, and there are so many secrets between them. 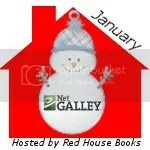 I received this book from the publisher as part of the NetGalley program in exchange for an honest review.